Former Josephian cricket captain and stylish left hand batsman Jonathan Alles who put all bowlers to the sword when he was wielding the willow for the Darley Road School was recently promoted as Chief Executive Officer at Hatton National Bank. 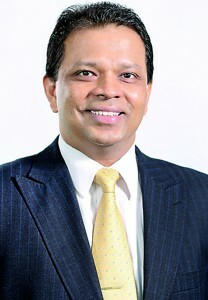 Alles will assume responsibilities as the Chief Executive Officer of HNB following the retirement of Rajendra Theagarajah and will be appointed to the Board with effect from July 1, 2013. He has well over 25 years of banking experience. When he sported the school colours, he was a big attraction with his stylish and elegant stroke play. Had he given continuity to his immense talent after leaving school he sure would have sported Sri Lanka colours. But while he was lost to the game, it was the banking sector – Hatton National Bank – that gained. Alles played in the company of Ashley de Silva, Hiran Cooray, Jeevaka Candappa, Brian Rajadurai, Rohan Weerakkody, Rukshan Soza and Mohan Ratnayake. He starred in Candappa’s team that beat Royal after 32 years in 1984. Alles captained SJC in 1985 and was adjudged best school captain that year, while being the college Head Prefect also in that same year. Jonathan also excelled in athletics representing St. Joseph’s College.